Earn Money, But Keep Your Hands Clean! “We paid for this room the organizer should take care of the order accordingly,” said the moderator Li Pengyi on the podium, with a sour mien. Li is the head of the Chinese Group for Education and Media. In his eyes, the order of the opening joint conference of Chinese and English publishing companies on April 16th at the London Book Fair (LBF) was disturbed because some troublemakers among the audience raised pictures of imprisoned writers and slogans such as “Free Speech” or “Stop the literary inquisition.” The English security guards did not intervene and a furious Li Pengyi may have wondered why money did not work this time. Yet money does work. The Chinese government has sent over one thousand people to the Book Fair, including writers, publishers, government officers, journalists, translators, logistic staff, and, last but not least, the bodyguards. This costs money. Besides, as guest of honor and market focus, China has occupied a huge space of the exhibition Hall at Earl Court. Months before the event, different English groups with journalists, administrators, cultural bureaucrats, and politicians were invited to China to consult about the Book Fair, and the hospitality and generosity of the host were impressive. 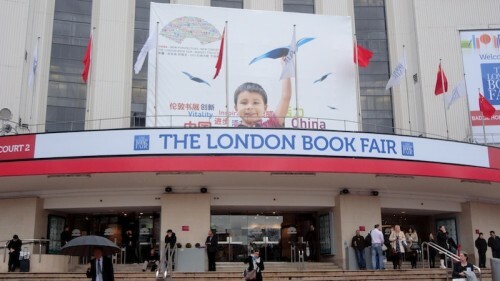 The London Book Fair is not only a cultural event, but also an enormous commercial chance for Britain. Two hundred years ago they brought opium to China, now they want to bring liberal thoughts, science, and technology. The goal stays the same – earn money. But there is an extra blemish this time: the British Council and the LBF have no other counterpart other than the General Administration of Press and Publication in China , which implements censorship, bans books, controls the ISBN numbers, and strangles the media. The British Council has a policy of engagement and is supposed to promote cultural understanding between the UK and other countries. However, in the case of China, the Council engages with the perpetrator. This old cultural institution was attracted only by the business potential, the market, and the profit. Only approved authors could attend the London Book Fair. Even Chinese writers living in London din’t have a chance to participate. Famous writers like Jung Chang ( “The Unknown Story of Mao Zedong”) and Ma Jian (Bijing Coma) were rejected. Has Chinese censorship reached beyond the border and lowered the proud English head? Guardian journalist Nick Cohen’s article “The British Council brings more shame on us ” seems to imply this. Is there any recourse for Western countries to trade with a dictatorship and keep their hands and conscience clean? How can they earn money but save face? There is no guaranteed strategy, but with a delicate touch and common sense one can find spaces and alternatives to uphold the value of freedom and human rights. In the case of the London Book Fair there could be more parallel activities and readings where independent intellectuals, writers and scholars are invited. Even the work of Tibetan or Uyghur writers should be shown to the public. After all, any collaboration with a declining dictatorship is always a double edged sword.